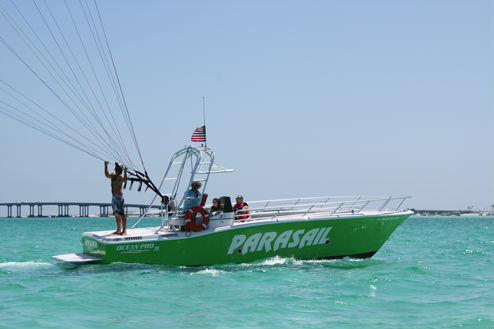 - Hop aboard our state of the art parasail boat - The SkyScraper! She's an absolute beauty! Here's the boys doing a few final checks before a flight. XL Jets Destin also offers Jetski rentals in Destin, Parasail in Destin, Dolphin Tours in Destin and Pontoon Boat Rentals in Destin er and now offers charter fishing. 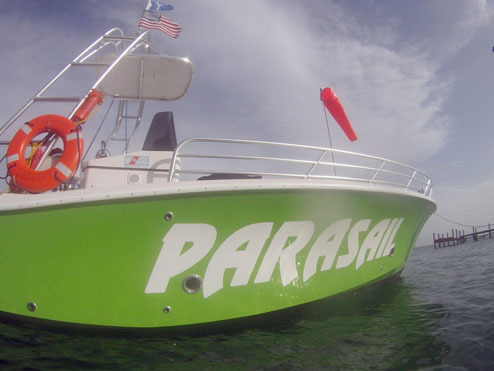 Check out our new sister company Destin Parasailing. Also have a look at our blog! 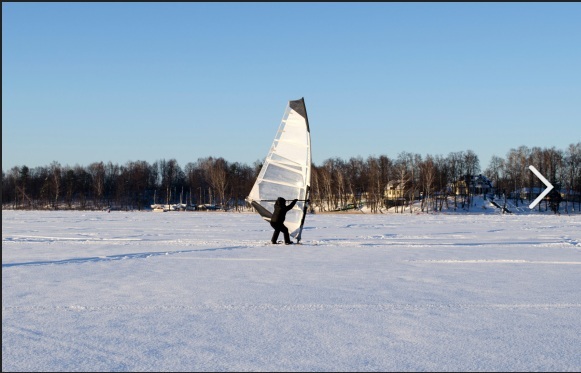 Click the picture featuring Xtreme Winter Sports like Ice Surfing! Sure don't! You may enjoy a small splash if it's windy but you don't have to get your toes (or NOSE) drug through the water if you don't want. Just remind the captain before your flight and we'll accomodate your request. Will we fly past our Beach Condo in the Gulf? We will ALWAYS fly the Gulf if weather permits! Depending on the wind direction though, we can't always safely fly near the beach. If the water is too rough, there is even MORE to see in the Bay since you can see the ocean and everything in the bay. Will we get to see dolphins? More than likely yes! We see them almost every morning from our dock before we even leave! We do our best to find the dolphins and try to get them to surf behind the boat for some awesome pictures! Don't waste time on an overcrowed Dolphin Tour boat - book a waverunner dolphin cruise for an experience like nothing else! 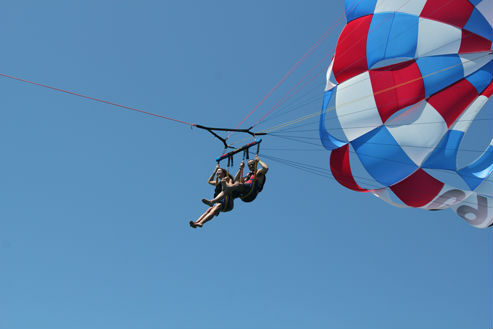 How high will we fly while Parasailing Destin? We will be flying you at 500' above the water! That's as high as ANYONE can leagally fly you period. Don't fall for 800' or 1200' traps - that's simply just advertising! We follow ALL regulations. Besides, with the Air Force base on the other side of the bay - you don't want to get to close to an F-15! 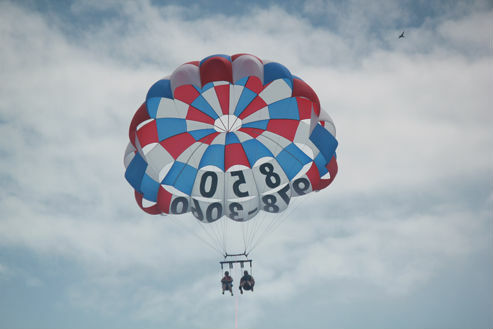 I am afraid of heights, should I parasailing in destin? Parasailing in Destin can definitely look intimidating. Our experienced crew does an amazing job at making sure nervous fliers are comfortable. You may think you will get sick in the air, but you are actually floating very gently and shouldn't worry about feeling queezy. It has no aspects of a roller coaster ride. Also, with you hovering over the gulf your brain won't differentiate between 10 feet and 100 feet! Parasailing shares a lot of the same qualities of a hot-air balloon-ride. What is the Age/Weight Limit? Wear a bathing suit, some flip-flops, don't forget your towel and some shades! We have a little storage on the boat to pack your shoes, billfold, cell phone or camera. Your sun-glasses will not fall off when parasailing as long as they don't fall off of your face when looking down. Please leave your lunch on the Dock. Alcohol is ok as long as it's in a can and you take your trash with you!